Over the past year or so, we've noticed a pink trend happening in furniture and textiles (and it's not just our rose-colored glasses). The traditionally feminine hue has staked its claim on all manner of interior spaces, from crafty upholstered pieces to sleek yet warm Scandinavian furniture. Next month's furniture issue delves into the look, but in the meantime, here's proof that the color won't look dated any time soon: a roundup of pink-toned pieces on the floor at Milan's annual furniture fair. 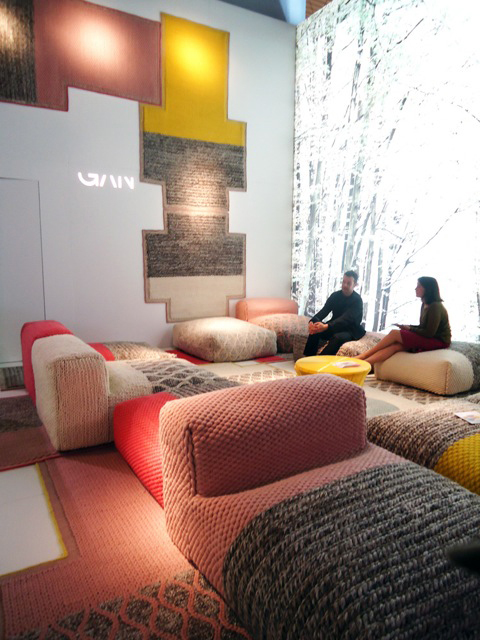 A new, oversized-knit modular sofa system from Gan-Rugs designed by Patricia Urquiola. Helping to prove our thesis that Scandinavians are the drivers of the pink bandwagon, Muuto presents several pieces in a new pink shade for 2013, including this Anderssen & Voll sofa. Missoni Home's signature chevron flame stitch comes to the outdoor sphere with digitally printed fabric that stands up to the elements. Vitra's booth combines pink-toned furniture both old and new with accessories from up-and-comers like Oyyo (rugs) and Form Us With Love (copper pendant lamp). Arper's new upholstered stools in pink, and their tinier cousins, a matching child's chair. Edra, an Italian materials manufacturer, hired the Campana brothers to design a series of arty beds. This one is reminiscent of both Fraggle Rock and raver accessories. A custom pink ombre colorway for Dedon's Swingrest; word on the street has it that Shakira already bought this piece off the floor! Two combination desk/seats by Fredrik Mattson for Blå Station. Terrazza chest of drawers by Emiliana Design Studio at Valsecchi. Two stools by Stefan Diez for e15. And on the Day-Glo side of pink, a miniature CMYK lamp hiding in the ceiling at Rossana Orlandi's famous project space.